We took our time getting started today before leaving Yank's RV Resort. Around 11:00, we got packed up and disconnected utilities. After saying goodbye to George & Laurie, we made a stop at a nearby gas station to fill up the motorhome and Jeep. These California gas prices are killin' me. 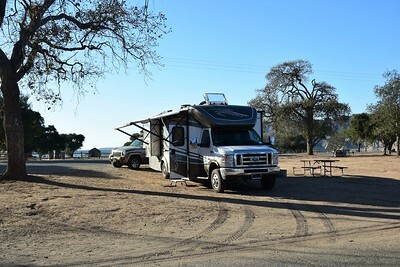 It was a pretty easy 165-mile drive with most of that being on U.S. 101, and then we took CA Hwy 154 for about 15 miles to the Cachuma Lake Recreation Area. 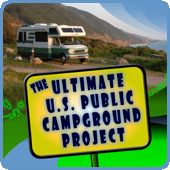 They have over 100 full hook-up sites, lots of water/electric sites, and a couple hundred or so "tent" sites with no hook-ups that can be used by RVs as long as you fit. They let us drive in and pick a site. We unhitched the Jeep, and decided we would take a site with no utilities. I made a quick drive through the park and selected Site 471 at the end of the peninsula with the lake on three sides. All the tent sites are dirt - there doesn't seem to be a blade of grass anywhere. and we're happy to have a view of the water in California for only $25/night. It's $40 for partial hook-ups and $45 for full hook-ups, and premium lakeview sites are $40 (no hook-ups). Not sure why our site isn't a premium site, but we're glad it's not. Now, while I was driving around looking for a site, I saw some people talking to Linda at the motorhome. So, here's our small world moment for today. Except for the hook-up sites, there is practically no one else in the 200 or 300 tent sites. But a couple driving by our rig, Bob & Kat, recognized Linda and stopped. We didn't expect to find anyone here that we knew, but sure enough we did - or rather they found us. 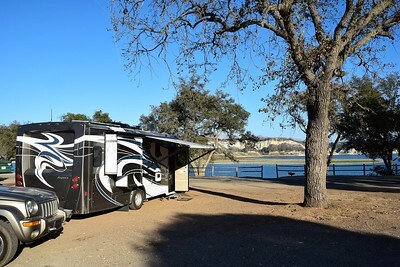 They pulled in with their fifth wheel and selected a site a few minutes before we arrived. And, get this, we were camping with them on a lake in Texas exactly one year ago today. So, Linda made something called a French Quarter Cheese Spread, grabbed a couple bottles from her recent wine acquisitions, and we joined Bob & Kat for Happy Hour outside by their rig where we chatted about what we've been doing the last year. They told us of their trip to Mexico and encountering the Gray Whales at San Ignacio Lagoon. It sounded like something we need to do. Volunteers (WWOOFers) stay and help on the land and home for 4-6 hours a day ..... and hosts provide the food and accommodation. The vast majority of WWOOFers are younger people and NOT RVers. However, in the U.S., there are farms that have RV parking for their WWOOFers. I did a quick search on farms with "RV/Camper Parking" on WWOOF-USA, and 655 farms came up in the search results. 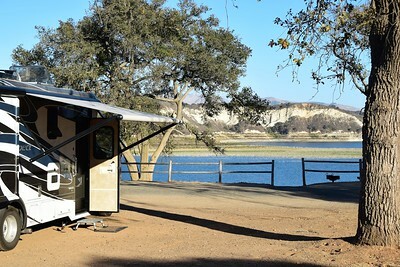 Most of these are dry camping, but some may have an RV pad and possibly even hook-ups. It's yet another option to keep camping costs down in exchange for some short-term work. Other lodging options for WWOOFers are: RV/Camper (meaning the host owns it and you stay in it), Bedroom in House, Separate Structure, Yurt/Tipi, Tent Camping, so it is definitely not an RV-specific program like Harvest Hosts or Workamper News. Bob & Kat had good experiences, but you have to be diligent about knowing exactly what you are getting into and expectations of the WWOOFer and Host must be worked out upfront. It's very similar to the advice we give for taking on a Workamping position. Of course, with the recent time change, it got dark early and cooled off quickly, so we retired to our respective rigs. 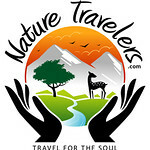 But before we did, we made plans to get together for breakfast tomorrow in the little Danish village of Solvang before we head to Ventura to visit the Channel Islands National Park Visitors Center and then take our wildlife cruise. And thus we had a fun, unexpected end to our day. Nuts. We’ve passed each other like two ships in the night. We’re up in San Juan Bautista, north of Monterey. I suppose you are headed south/east from there? We are staying put for the next couple of months while Bev has some more work done on her shoulders.